A social drama and romance, Primrose Path tackles weighty issues including poverty, prostitution and alcoholism. 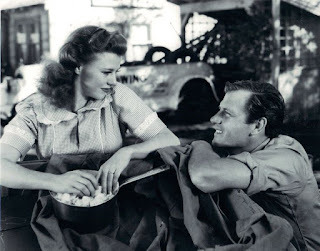 In a small seaside California town near San Francisco, Ellie May Adams (Ginger Rogers) is a teenager growing up poor in the working class Primrose Hill neighbourhood. Her mother Mamie (Marjorie Rambeau) supports the family by working as prostitute. Grandma (Queenie Vassar) is a bitter former prostitute herself. Ellie May's father Homer (Miles Mander) is a college educated expert on Greek philosophy now wasting his life as an unemployable alcoholic. On a trip to the beach Ellie May meets and quickly falls in love with Ed (Joel McCrea), a jovial server at the restaurant owned by the good-natured Gramp (Henry Travers). Embarrassed by her family, Ellie May lies her way into Ed's heart. They get married and find happiness, but when she finally finds the courage to introduce Ed to her family, life takes a turn for the worse. 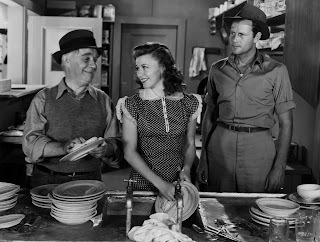 Co-written, produced and directed by Gregory La Cava, Primrose Path is a noteworthy adaptation of the stage play by Robert L. Buckner and Walter Hart. The film is an unblinking view of the class divide and the myriad social problems holding back women desperate to break the cycle. Despite the censorship constraints of the time, La Cava succeeds in getting the requite messages to the screen thanks to a sly and uncompromising script. The difficult issues are addressed in the frank language of economic necessity. Mamie is a prostitute in her prime, and her family would starve without her income. Homer is a fallen would-academic, now utterly dependent on the bottle to get through every day. And most heartbreaking is Grandma, a sour elderly woman who has allowed daily domestic stresses to ravage life's opportunities. Ellie May, already a school drop out and now burgeoning into adulthood, is doomed to retrace the career path of the women in her family. Grandma is shocked that Ellie May does not naturally appear inclined to follow in her mother's footsteps, and emotionally shoves her granddaughter towards whoredom. In to this morass Ellie May's whirlwind romance with Ed is introduced, a relationship not so much about love as it is about a young woman gaining exposure to alternatives and thriving when given half a chance. Ellie May resorts to deception to win Ed's affection, but once she gains entry into the respectability of a job at Gramp's, she is a vivacious income-earning young woman powering her way into happiness. La Cava effortlessly breaks the film away from its stage confines. Primrose Path does remain a series of dialogue exchanges but the settings move briskly between rooms within Ellie May's house, with several excursions to Gramp's restaurant, the beach, and the swanky bar where the town elites go to party. Several scenes even take place in moving vehicles, although some ill-conceived motorcycle antics backfire. Ginger Rogers proves her dramatic role abilities and dominates Primrose Path. At age 29 she convincingly brings to life a character more than ten years younger, and excels at portraying a young woman caught between her family and her future. Bold for its time, Primrose Path retains its clear eyed passion.